Your body works hard for you. It allows you to run, walk, work out, play with the kids and go about your daily life. But without the right support to mend and repair, you can start to experience the aches, pains of an over active body. About one third of the protein content in the body is made up of collagen, a complex structural protein and the primary building block for the body's cells and tissues. Collagen helps maintain strength and flexibility in ligaments, bones, joints, and tendons. It also supports healthy skin, gums, teeth, eyes, nails and hair and helps the body build lean muscle. Not all Collagen supplements are created equal. With all of the options, how do you choose the right one for you? First of all you will want to select a non-GMO collagen, sourced entirely from pasture-raised, grass fed cattle. This way you can be sure your collagen is free from both antibiotics and added hormones. Beyond that, you will want to pay attention to dosing. All of the latest research points to a scientifically validated recommended dose of 10g daily for optimal benefits. 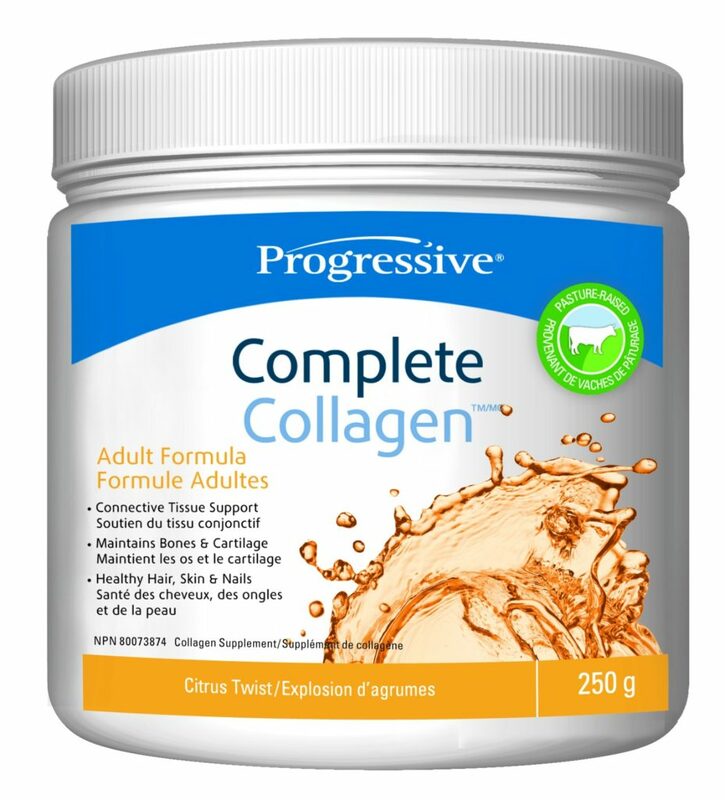 Complete Collagen from Progressive is a perfect choice as it contains non-GMO hydrolyzed collagen from pasture raised, grass-fed cattle (minimum 70% natural grasses), free of both antibiotics and added hormones. Each scoop provides 10 grams of collagen along with 100% of the RDA of Vitamin C (for its role in collagen formation), as well as 100 mg of L-Tryptophan to make it a complete protein. Collagen does NOT contain all the essential amino acids to make a complete protein, unless you add tryptophan. Tryptophan is the missing link that completes collagen’s amino acid profile, helping to improve its protein quality. Progressive Complete Collagen is enzymatically hydrolyzed for easy missing and better absorption. It easily dissolves into water or your favourite beverage and can be added to protein shakes or breakfast smoothies.